Frequently Asked Questions of Drill Grinder, Universal Tool Grinder Learning Mastery - Purros Machinery Co.,Ltd. How to use the drill bit grinder before we sharpen drill bit by hand(manual mode)? 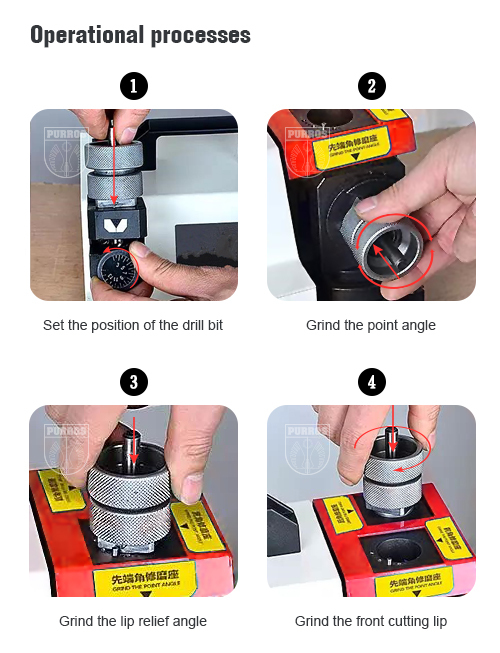 The operation of the drill bit grinder is very simple, you can refer to the pictures below for the operation, or view some videos from here, also you can get technical support from us. Does the usage of drill bit grinder need to keep professional skills or knowledge? No, it doesn’t. The usage of drill bit grinder is fool-style, anyone can use it. What should I do if there is any problem with the drill bit grinder machine? We only supply good quality and good reputation factories’ equipment. There won’t be big problem. At the same time, we will provide 1 year warranty of technical support and spare parts to our clients, and life-time after sell service. How can I contact Purros for the fastest response to the drill bit grinder machine? Please check out the contact page. There are several ways for us to serve your purchasing requirement. I can not find the different model of drill bit grinder I want on Purros’s website. Please contact us. Not all the model of drill bit grinders that we are supplying are put on the website. We will do our best to supply the right thing to you if we know your demand. My country serve different voltage and use different plug from China. Can the drill bit grinder machine I buy from China be used in our country? Yes. We have exported a lot of drill bit grinder machine all over the world these years. We can make the machine with your plug and suit to your voltage. We also have English manual for the equipment. How do we carry out an order? You choose the items that you like, and send us the order details via email. We quote you our best prices. We issue Proforma Invoice to you to confirm the order when both parties agree on the prices and terms. You transfer 30% deposit by T/T to our company account or Western union. We start production immediately after we get the deposit. We take photos and e-mail to you for your confirmation when the orders get finished. You transfer the 70% balance payment after you confirm the products are finished. We ship the products right away after we receive the balance payment. After shipment, we send the required shipping documents for your customs clearance purpose. You pick up the cargo from the shipping company. Can we order some samples before we place big order? Yes, you can order samples to check first. And we will charge sample fee and the express delivery cost. Fee should be paid before shipment. What are the prices for the products on the website? To get price, please send us the items numbers and quantity you want via email, if you want to know the shipping, please include your address. We will quote you our best price according to the item and the order quantity. Do you accept OEM and custom order? Of course, any kinds of OEM and custom orders are welcomed, just send us the drawing and details of your design. We will send you samples if we both agree on the details. It depends on the product, just feel free to contact us, we will try our best to meet your requirement. Westernunion: orders less than $1000 USD. T/T: Telegraphic Transfer(wire transfer), 30% deposit,balance before shipment. Shipment: How we send you the goods? It depends on customers’ requirement and the quantity of the order. Normally,orders are shipped by boat in containers via our shipping agent. We can ship to all the seaport of the world. Lead Time: When we will ship out the order? We will arrange production once the payment is confirmed. And normally, it will take a week or less to arrange shipment. Delivery Time depends on the destination. If you have any complaint, just feel free to let us know, we will try our best to improve it. Compensation of damaged or defect item? It may cause damage during shipment, we have tried our best to avoid this. If this happened, just feel free to let us know. Please send us photos of the damage item. If possible,please kindly send some pieces back for us to check. We’ll be responsible for the damage. We’ll send you the free replacement in next shipment or deduct it from next order amount.